1. David Ginola and Lee Dixon > The Two Alans. Ginola and Dixon may have kicked lumps out of each other back in the day (Ginola once named Dixon as the best opponent he ever faced), but as colleagues on the MotD2 sofa, they showed the potential to be punditry’s excellent new Odd Couple. Ginola is nuts, in a good way, and Dixon is just a fine young pundit. However, Colin Murray’s ‘and finally’ wine bit (his idea?) was ill-judged. Overall though, it’s still MotD 0, MotD2. 2. Roger Johnson is very English. I greatly enjoyed Johnson’s ‘stiff upper lip’ reaction to the bad boy antics of Hugo Rodallega. Many players would have gone down after Rodallega’s inciteful use of the head, but not Rog. He kept calm and carried on. Well played sir. 3. Steven Gerrard got off lightly. Is it really okay to lead with the elbow, as Alan Hansen said on MotD on Saturday night? No. But once again, Gerrard’s status as the English game’s ‘Mr Football’ saw him get away without seeing a possible red card, after an ugly elbow on Danny Welbeck. 4. Most people don’t know the rules of football. I count myself in this number. To wit, Dirk Kuyt’s controversial goal vs Sunderland was perfectly legal; Michael Turner was foolish to give the appearance of taking the free-kick, whatever his intentions, but by the rules he did take it – so how about he takes some responsibility for his casual actions? That said, Stuart Attwell is a poor ref who shouldn’t have turned his back on play, and you can easily argue that he might have used common sense on this occasion. And no one is talking about Nando Torres being a bad sport? If it was so obvious that Turner hadn’t taken the kick, why did Torres play on: opportunism or cynicism? 5. Fans are staying away. 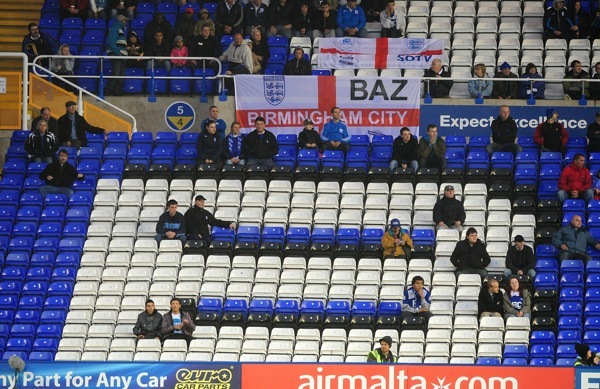 As the recession continues to bite, you can see more and more empty seats at Prem grounds. Time for clubs to adjust their ticket prices accordingly. Who would spend upwards of £100 to watch their team battle Stoke City? 6. Roberto di Matteo is a fine young manager. Despite his ridiculous eyebrows, which lend him the appearance of a Gerry Anderson puppet, Bob di Matteo is not to be mocked. He’s a sincere and likable young gaffer with a bright future ahead of him. Future Chelsea boss? Yeah, you bet. 5. No one, Stoke City play the worst football I’ve ever seen, and I saw them at the ground yesterday, so this is up-to-date. 6. He was a terrible guest on Goals on Sunday, but looks good on the management. 7. Lee Cattermole can manage a game where he isn’t red carded. thank you for saying kind words about bobbie matteo, don’t like to think of him leaving but…yes I guess ‘that day’ will come..christ! He’s not a bad sport. He looked back, saw the ref waving him on, and rolled the ball across. He was playing to the whistle (which I was told to do when I was 8), so to try to point the finger at him for Dawson’s mistake and Attwell’s peculiarities is just pathetic.